Kihei Beach is a bright, cheerful and affordable south Maui vacation retreat with a 360-degree view. A casual Hawaiian island style atmosphere perfect for relaxation and kicking back. 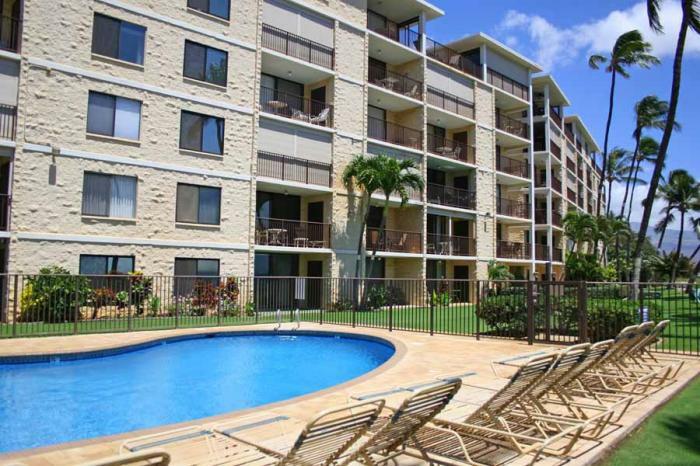 Kihei Beach vacation condos are within a single six story building sitting oceanfront. Conveniently located next to the local Hawaiian Canoe Club with a convenience store and farmer's market just across the street. This property's north Kihei location makes it perfect for getting to Ma'alaea Harbor, the Maui Ocean Center and a launching pad for any of the island's amazing adventures. With Haleakala as the backdrop you are sure to be more than pleased with your accommodations and views. Take a stroll on the long stretch of sandy beach and enjoy the mesmerizing waters. Feel the warm trade wind breeze and cool off in the pool after a long day, or sip a glass of wine before an alfresco dinner. Romantic sunsets, perfect for whale watching during peak season (Dec - April) and less crowds Kihei Beach has beautifully appointed condos with a view that will take your breath away.